Heat oven to 375°F. Spray 2-quart casserole with nonstick cooking spray. Brown ground beef in large skillet over medium-high heat until thoroughly cooked, stirring frequently. Drain. Stir in all remaining ingredients including seasoning packet from rice; mix well. Bring to a boil. Spoon into sprayed casserole. Cover tightly. Bake at 375°F. for 40 to 45 minutes or until rice is tender. Chili powder is a blend of dried chiles, garlic, oregano, salt, cumin, coriander and cloves. The aromatic seasoning is spicy-hot, but its flavor and color vary depending on the brand. Salt-free chili powder is also available. Garnish this casserole with a sprinkling of shredded Cheddar cheese mixed with a dash of chili powder and oregano. The hot casserole will melt the cheese into a pretty topping. 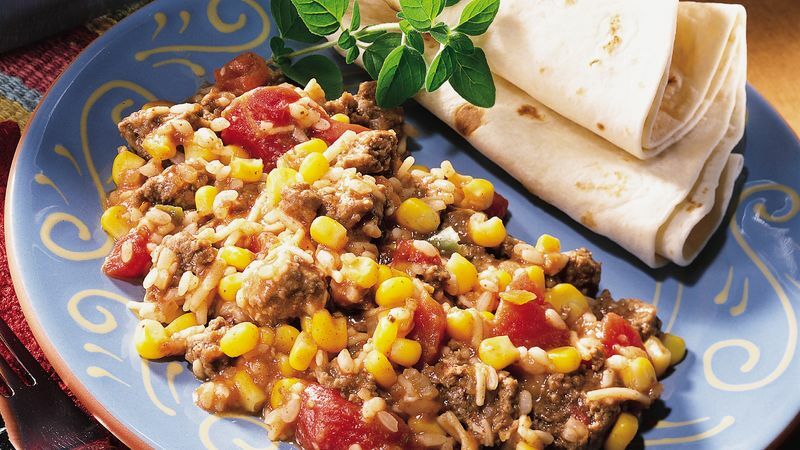 Four South-of-the-Border Beef and Rice Wraps, roll flour tortillas around scoops of leftover casserole; serve them warm or cold.